I went to La Clusaz for a weekend away with my husband and step-daughter. The purpose being to have some quality family time where three very different levels of skier could enjoy the slopes together. My goal was to become confident and able to ski down any blue slope and finally getting out of my beginner/intermediate boots (this didn’t quite happen but it’s finally all clicking into place). My step-daughter wanted to improve her form and feel confident tearing down any slope. And finally my husband, who wanted to see what he was capable of after breaking his shoulder into three pieces last year. His nervousness lasted 10 minutes before he was back skiing pretty much anything again. As it turns out La Clusaz is the perfect place for a mixed group of abilities. La Clusaz is one of the most popular ski resorts in the French Alps. This purpose-built ski resort is in the heart of the Aravis in the Haute-Savoie region and is perfectly located with less than an hour’s drive from both Geneva and Annecy airports. It’s an alpine village nestled in the mountains and it’s breathtaking with its pretty buildings and dynamic views of the mountains and slopes. The atmosphere here is very laid back so you can go at whatever pace you like – from a massage and early night, to après-ski and a late night pizza. 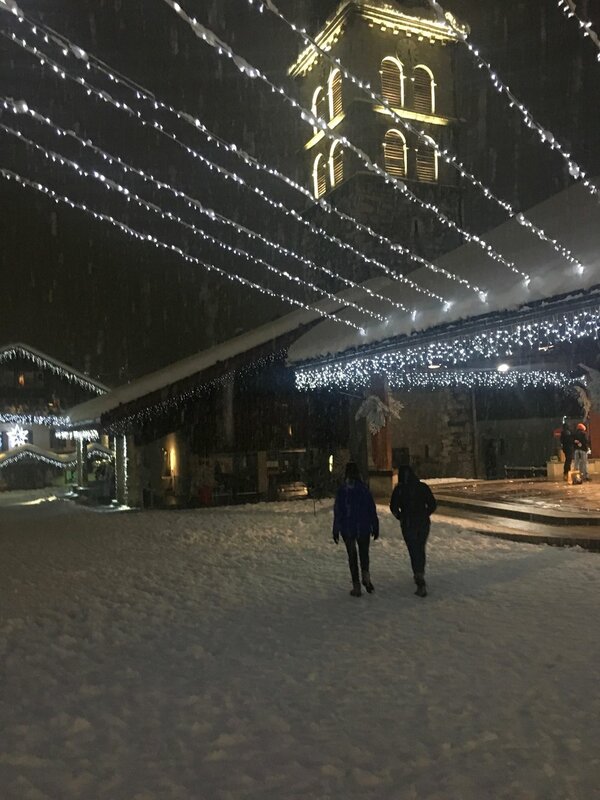 I really do think La Clusaz is one of the best places I’ve visited for a family as there are great training slopes, lots of child friendly restaurants and you can walk around the town in 30 minutes. There are also plenty of shops to explore. La Clusaz is very French and by that I mean other than pizza and pasta you’ll struggle to find any other nationality of food but to be honest this is the case for most ski resorts in France. We were there for four days and three nights which was just about the right amount of time before the food boredom levels kicked in. I hope this doesn’t come across as negative, it’s just there’s only so much meat, cheese and bread a girl can eat! I definitely would have enjoyed cooking in our apartment a few times if we’d been there for a week. Overall the restaurants were great with lovely atmospheres and good quality food, and not as expensive as other ski resorts. One of the highlights of our holiday was finding the apartment we stayed in Résidence Les Grandes Alpes. It’s perfectly located in the mountains with only a two minutes walk from the centre, and five minutes from the slopes. 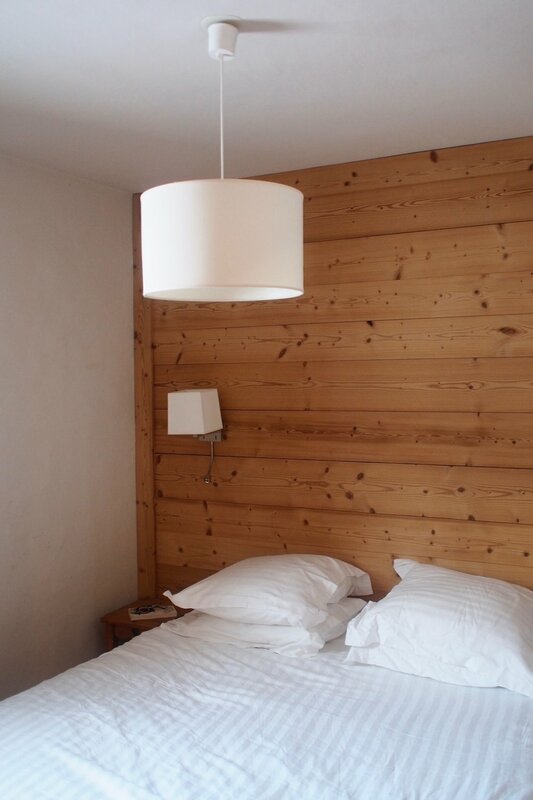 It had a modern alpine feel inside the apartment and was very spacious so you could definitely enjoy nights in, especially with the stunning views of La Clusaz and the surrounding mountains from our balcony. The apartments had all modern features such as a coffee machine, dishwasher, TV, free WiFi. You also have access to a whirlpool, sauna, heated indoor pool and a games area with a football and pool table. It was the perfect medicine after a day on the slopes and would be ideal if you had children to entertain. This was also the perfect place for us to get ready after our final day on the slopes as we had a very late evening flight. The staff on reception made it very easy to store our bags and gave us towels to have a shower so we could freshen up before our flight. What else made our stay at Résidence Les Grandes Alpes so enjoyable was that it was ran like a hotel. You had the luxury of a spacious apartment that you could cook in but it had a reception and menu that you could order from for those lazy evenings. In fact you could have lazy mornings too – if you ordered your bread and croissants before 7pm they would be waiting for you on your doorstep the next morning. Not only that it had toilet roll and cleaning products (dishwasher tablets and washing up liquid) on your arrival so there was no need to go shopping. In fairness none of this was a problem as the supermarket was perfectly placed one minute from the apartments with everything you would ever need. There was also private parking for your car in a garage which was really useful for our hired car. The holiday was perfect and just what we expected. La Clusaz had amazing snow with slopes for everyone with a picture-perfect town to wonder around; great restaurants from relaxed to high-end; nice bars to have a chilled glass of wine or après ski; perfect cafes for hot chocolate and crepes. What more would you want from a ski holiday? I’ve already recommended it to friend.